Like us on Facebook for up-to-date information on events, resources, and news! Save the Date! 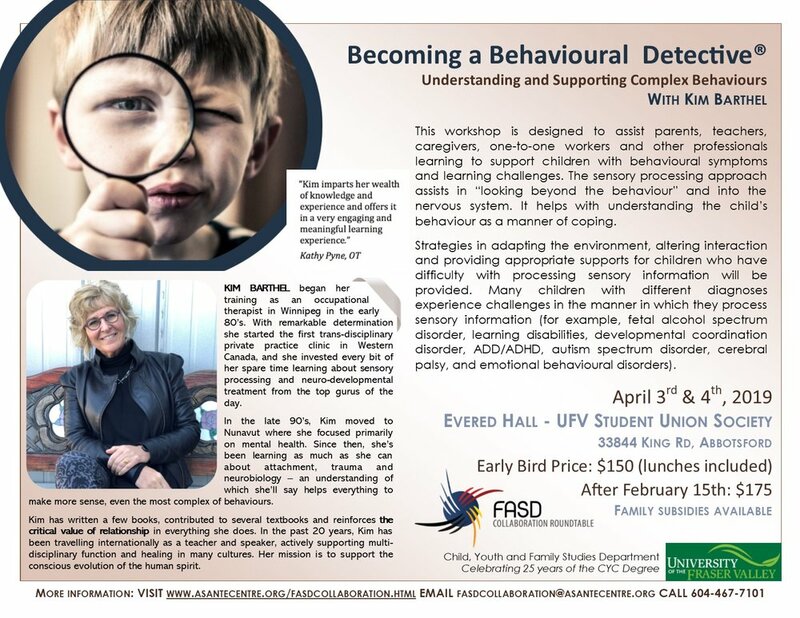 On April 3rd & 4th, 2019, join us in Becoming Behaviour Detectives with Kim Barthel! Where: Evered Hall - UFV Student Union Society, 33844 King Rd, Abbotsford. Early Bird: $150 After February 15: $175 Subsidies are available. What is the FASD Collaboration Roundtable? The FASD Collaboration Roundtable – as the name suggests – is a way of bringing together people from across systems to network, share information, discuss issues and problem-solve effective responses, then try to entrench that in policy and practice. The goal is to involve all of the key systems and agencies that deliver services to children, youth and adults with FASD in the greater community. In addition, the Roundtable welcomes the voices of parents, grandparents, other caregivers of individuals with FASD, as well as other advocates, for the experience-based perspectives these stakeholders bring to the discussion. 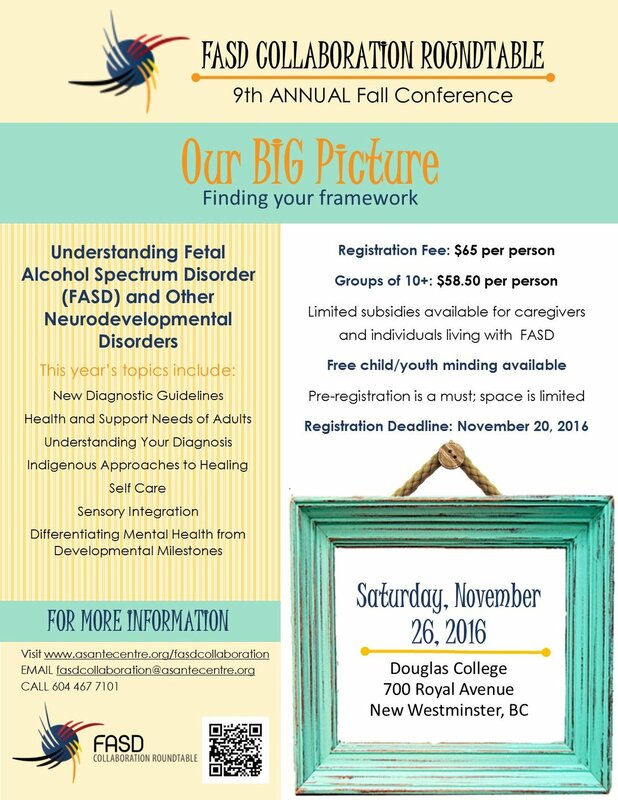 What can I expect from the Annual FASD Fall Conference? 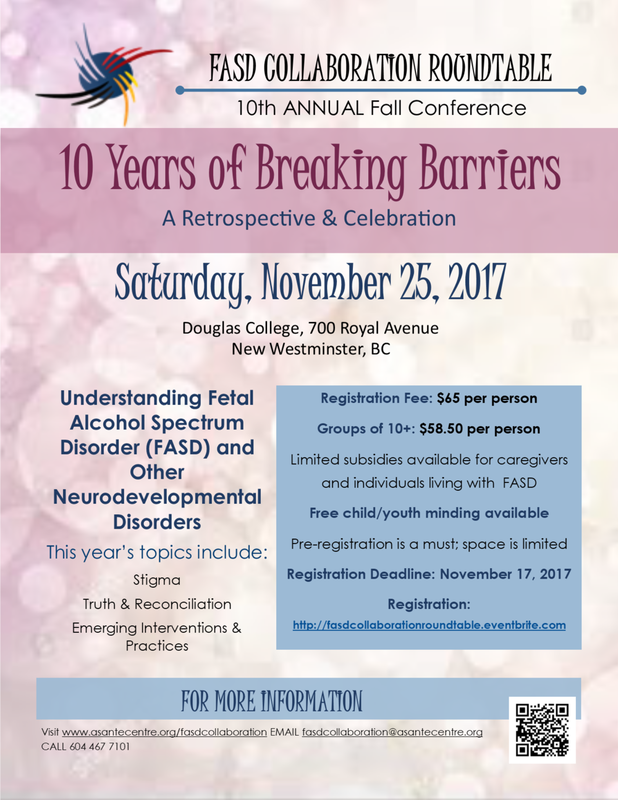 Each year the FASD Collaboration Roundtable's organizing committee provides an opportunity for learning and networking around FASD through the Annual FASD Fall Conference. 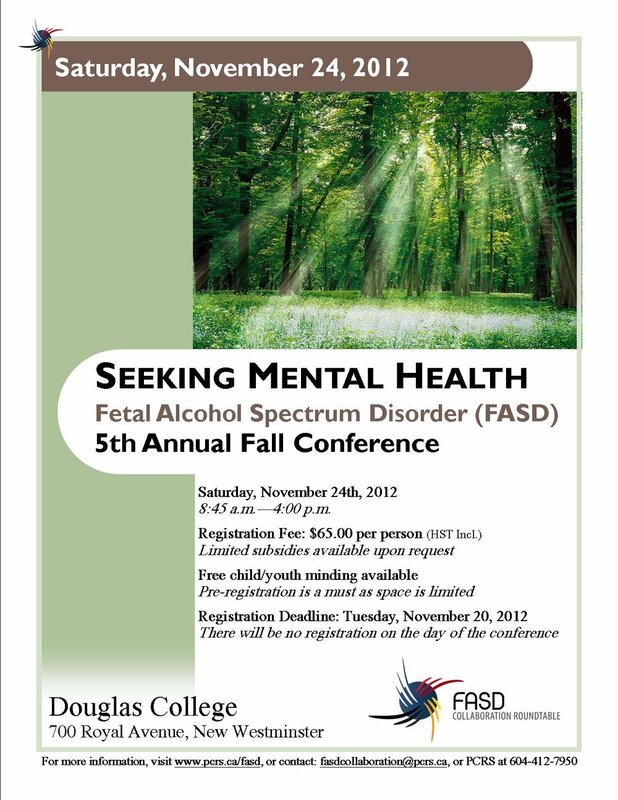 The conference theme varies from year to year, but always focuses on a topic pertinent to FASD. Learning takes place through a variety of forums, including lecture, panel discussions, performances, information tables and group discussions. Participants learn about emerging knowledge of FASD and relevant concerns, as well as practical implications for support. All participants have an opportunity to learn about resources and supports available in the community, with an emphasis on networking and liaising with professionals and families. Kim Hetherington is a social worker with MCFD in the Fraser Region who has developed an expertise in the science of childhood adversity and its impact on child’s development and functioning through her extensive research and training. Kim is training in Dr. Bruce D. Perry’s Neurosequential Model of Therapeutics Certification Program to continue to enhance her clinical skills. Kim’s social work experience has included child protection, family service, guardianship, resource social work, and Dispute Resolution Consultant. Kim supports East and South Fraser in her role as a Guardianship/Children & Youth with Special Needs Consultant. Kim also provides trauma informed care support as a coach for the Complex Care Intervention Program in East Fraser. Kim’s passion to share emerging knowledge pertaining to this exciting practice approach has resulted in the establishment of six Trauma Informed Communities of Practice monthly meetings in East and South Fraser encompassing participants from various agencies, ministries, and community partners. Roxanne Hughes has been an FASD Key Worker with PCRS for the past 8 years, since the inception of the program in BC. She provides support to families who are parenting youth (ages 12-18) who have FASD or complex needs (difficulties similar to FASD). In addition to one to one family support, Roxanne also facilitates monthly parent support groups and offers training to a broad range of community partners. She has a Bachelor’s in Social Work and is currently working on a Master’s in Social Work degree. Sara Griffiths is a Program Manager with PLEA Community Services. She is responsible for the U-Turn Specialized Residential Program which offers services to young people who have not experienced success in other residential programs. The services offered to youth are tailored to fit their needs which may include mental health, addictions, individual counselling needs and extensive community support. After 19 years of working as a youth worker, school counselor, and FASD coordinator Sara has encountered many young people and families living with FASD. Her understanding and passion regarding FASD came after 7 years as a foster parent trying to navigate the system and support children who were sadly misunderstood. She has spoken at International, National and local conferences about the importance of understanding this brain based disability, using her experiences as a reference point for teachable moments. Sara provides FASD training within PLEA and the community. Glenda Jansen has worked with Special Needs individuals for the past 12 years, and the past nine as a Special Education Assistant at an independent private school. Her last assignment included providing ongoing support to a student with FASD through grades 5 to 8, which was challenging but extremely rewarding. In 2009, she became a “go-to” person for a man with FASD whom she continues to support, and was instrumental in his diagnosis and advocated for services, including disability and housing. The past 8.5 years, Glenda has volunteered her time doing outreach to the marginalized in the community of Richmond, building relationships with many and advocating where necessary. This began as a weekly Sunday dinner she and her husband began out of the back of their car in the centre of Richmond, and has taken her places she would never have imagined! Elizabeth McWilliams Hewitt, MA Ed., has worked in the field of developmental disabilities, including FASD, ASD and anxiety in a variety of settings including respite care, residential, school and home-based programs for over 15 years. Through her private practice Elizabeth provides consultation to families and support teams in the field of developmental disabilities; service is based upon the unique needs of the individual, their development and what is meaningful to the person and their family. In addition to her consulting work, Elizabeth also works as a sessional instructor at the University of the Fraser Valley in the Early Childhood Education/Child and Youth Care programs. This is a rewarding experience in which Elizabeth has the opportunity to share her passion with future practitioners. Allison has been with the Asante Centre since 2009, and Executive Director since 2017. Allison began working in the field of FASD in northern BC, now carrying almost 15 years of experience in supporting individuals and families with neurodevelopmental disabilities. A certified teacher, Allison has benefitted from working in public as well as early childhood and adult education. She has collaborated on initiatives addressing neurodevelopmental disabilities within family services, criminal justice, employment, and health systems. Later completing her Master of Arts in business leadership, Allison also brings a passion for cross-sector collaboration, values-based leadership, and sustainable social programming to her role. She is committed to integrating trauma-informed best practices, cultural responsiveness, and expertise of individuals with neurodevelopmental disabilities more deeply throughout the Centre’s activities. Richard Willier, BA, FASD Specialist, Cree, FASD Collaboration Roundtable member, planner of the (BC) FASD Fall Conference, and the Downtown Eastside FASD Conference follows Aboriginal spirituality and is an FASD Advocate. His passion in working with those experiencing FASD led him to assist in developing a National FASD Screening Tool in 2007. He’s referred many people for an assessment; created many FASD learning materials and FASD pocket cards; been involved in a number of FASD projects. Richard has presented FASD materials at the International FASD Conference and the Annual (BC) FASD Fall Conference, the Edmonton International Prevention of FASD Conference in 2013, the 2015 Pre-International FASD Conference for members of the legal system, among various types of groups since doing an endless number of local, regional and international FASD presentations to different audiences in BC, Alberta and Ontario. He has co-facilitated an FASD caregivers group, and is a former FASD mentor. Richard has been part of the FASD Fall Conference planning committee for the past 7 years and the FASD Collaboration Roundtable group since its inception. He’s noted as a change maker.